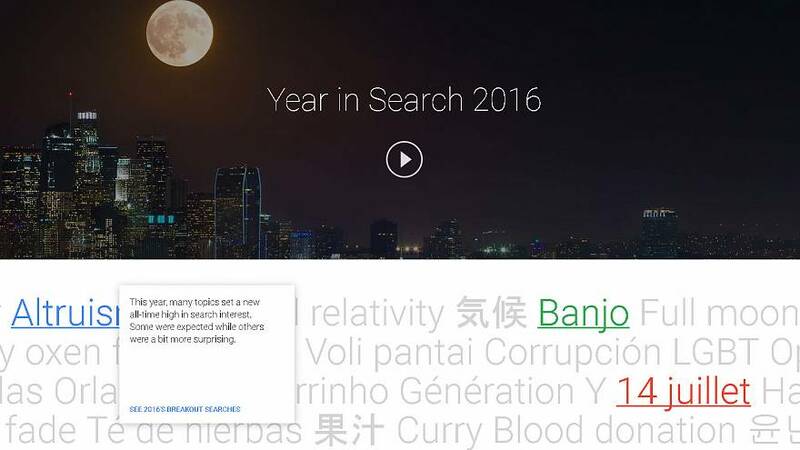 Google has released its summary of the most-searched items on the www in 2016. The winning search is Pokemon Go. In Britain the top trending story was the Euro 2016 football tournament but two musicians, David Bowie and Prince made the top five. In the news story category no prizes for guessing Brexit was the winner, but America’s Donald Trump topped the politicians’ list ahead of any British figure. Murdered Labour MP Jo Cox came in third. Male role models were topped by a reality TV star, mixed martial artists and two footballers, while women did little better in a list topped by Prince Andrew’s latest girlfriend, minor TV celebrities and singers. Four out of the five most searched-for movies were about cartoon superheroes, while the top recipe search was for blueberry wine, possibly because the great British public thought that it would count as one of their five a day, as “How to lose weight” was the second-top How To? search…just after How to play Pokemon Go.